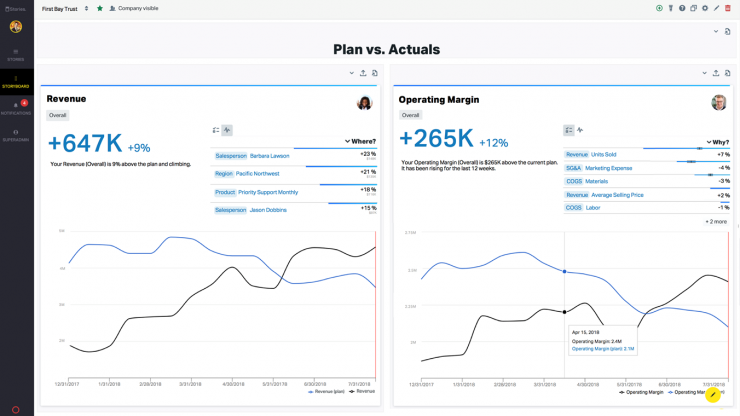 At Workday, we’ve been heavily investing in expanding the breadth and depth of our analytics capabilities by delivering robust solutions, including the addition of Workday Prism Analytics, which equips customers with faster, more intelligent ways to uncover true business insights from the growing volume and variety of data across their organizations. And today, I’m excited to announce that we are taking another step forward in our analytics journey with the acquisition of Stories.bi, one of the most innovative players in the analytics space. Stories.bi specializes in augmented analytics, a powerful approach that leverages machine learning and artificial intelligence technologies to automate analysis and deliver insights into what’s happening in a business. Stories.bi takes this a step further by identifying topline trends, issues, or opportunities in the organization, and then delivers personalized insights to a business user in a conversational, headline form such as “Actual shipments were $283,000 behind plan last quarter, 62% of which originate in Singapore.” From there, a user can go deeper to easily understand the drivers behind the headline—such as how this compares to previous quarters or the reasons for the change—and understand which actions they should take next. An example of how customers can get deeper insights with Stories.bi. With the addition of this incredible team and technology, we will power our analytics products to be more intelligent and our UX to be more conversational. This means our customers can find even more opportunities to improve their business without having to dig through data or wait on detailed reports. We’ll be sharing more about our analytics strategy and roadmap in the coming year—so in the meantime—please join me in welcoming the Stories.bi team to Workday! This blog contains forward-looking statements related to Workday, Stories.bi, and the acquisition of Stories.bi by Workday that are subject to risks, uncertainties, and assumptions. If the risks materialize or assumptions prove incorrect, actual results could differ materially from the results implied by these forward-looking statements. Forward-looking statements in this communication include, among other things, statements about the potential benefits and effects of the proposed transaction, as well as additional risks included in our filings with the Securities and Exchange Commission (SEC), including our Form 10-Q for the fiscal quarter ended April 30, 2018 and our future reports that we may file with the SEC from time to time, which could cause actual results to vary from expectations. Workday assumes no obligation to, and does not currently intend to, update any such forward-looking statements after the date of this release.